Last week I read a very troubling headline. 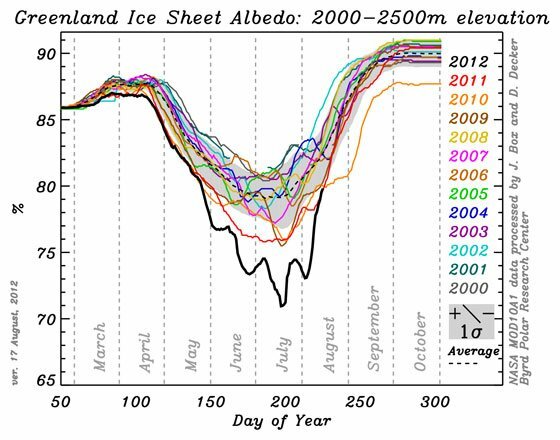 “Greenland ice sheet albedo continues dropping at highest elevations”, it said. Now that doesn’t sound like ‘changing the world as we know it’-type news, does it? But it just could be. The Greenland ice sheet is over 3 km high at its thickest point, and contains some 2,850,000 cubic kilometres of ice. Were it all to melt, global sea levels would rise by approximately 7 meters. The ice sheet reflects back the vast majority of the sunlight falling on it. One result is that while the lower altitudes experience melt during the summer, the higher altitudes do not. Up until now, that is. Here’s a graph, courtesy of www.meltfactor.org which shows the trend in the albedo (reflectivity) of the ice sheet at the highest altitudes. It shows a clear trend, over the period reviewed, of lowering reflectivity. The June 2012 figure is the worst summer figure for the 12 year period. OK, that still seems pretty academic information, until you consider where it may lead. The Greenland Icesheet’s Reflectivity (albedo) is dropping. The evidence suggests that we are nearing, or may have reached, a critical tipping point. One where the melting of the Greenland ice sheet not only continues, but accelerates. The result would be more and more fresh water pouring into the North Atlantic. THAT, has very serious implications. One of the principal drivers of today’s climate is the Ocean Conveyor. In a circulation pattern that covers the globe, water is warmed in the Southern hemisphere, and makes it’s way North as the Gulf Stream. The warm Gulf Stream current brings warmth to North America and Europe. But as it heads North, it is giving up both heat and moisture, becoming cooler and saltier the further it goes. Finally, now comprised of heavier, saltier water, it sinks below the less salty water through which it is moving, and heads back South. The Ocean Conveyor, through the Gulf Stream, warms North America and Europe. So here’s the nightmare scenario, particularly if you live in the Northeast United States, or in Europe. The Greenland ice sheet continues to melt at an accelerating rate. More and more fresh water pours into the North Atlantic. Driven down by increasing fresher water, the point at which the Gulf Stream dives, and heads back, moves further and further South. The moisture and warmth delivered to Europe declines as the Gulf Stream retreats further South. A much colder, dryer climate in Europe evolves. It may sound like science fiction, but this scenario could become a horror story. The whole of humanity would be authors of this horror story, but special mention would have to go to certain media proprietors, special interest groups and the toadying politicians who pander to both of them. As usual, it will be the poor, the powerless and the dispossessed who will pay the price. Everything we do as individual to reduce our carbon footprint, is truly worthwhile. To learn more about Abrupt Climate Change, click here. Please leave a Comment below- we welcome your feedback.